Located 72 kilometers west of Guiyang, Tianlong Tunpu Old Town is actually an outpost position of the Ming Dynasty (1368-1644). 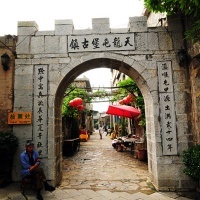 In 1381 A.D., for continuing his southward war, the first emperor of the dynasty, Zhu Yuanzhan stationed his soldiers here and built many stone barracks. 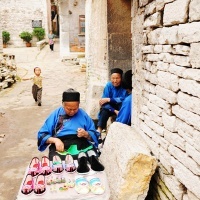 In China, Tianlong Tunpu is worthy of the name "the No.1 Stone Town in Southwest China" as all its houses were built of stones, even the locals' daily utensils. Stone foundations, stone walls, flagstone roofs, stone watchtowers, stone wall crenels, stone upstairs and stone dog holes...for centuries, the locals have characterized their houses as their army ancestors. 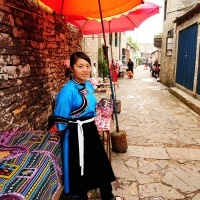 The people in Tianlong Tunpu still keep a very simple and peculiar army-style way of life. They dress in the Ming style. Especially the women, their traditional costumes come with long blue robes and white or black turban. They speak with the accent of their native regions on the south of Yangtze River and eat food with army flavor of the Ming Dynasty. In Tianlong Tunpu, the locals play a very old and interesting opera-Dixi (Ground Opera), which is known as the Living Fossil of Chinese Drama. The operas recreated the ancient Chinese tales from the Three Kingdoms (220-265) Period and the Tang (618-907) Dynasty. The performers wear black crepes and put wooden masks on their foreheads to ensure their voice could be heard by the audience. According to the Tunpu people, the opera indicates the minority people worshiping the god, expelling the ghost and praying for peace. When the visitors come to the town and request a watch, the locals will be very glad to show you a wonderful performance. 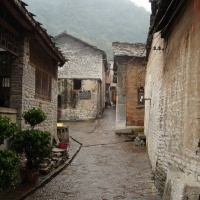 Today, about 5000 people reside in Tianlong Tunpu Old Town. They take care of their civilization as good as ever, thus their buildings, culture and unique customs have intoxicated many folklorists, military specialists, architects and archeologists from all over the world. just finished watching the last few minutes of a program called "Interpreting chinese fashion" and heard of an opera that is preformed about a female general that won a battle against her future husband. does anyone know the name of the opera or where I can find the story?